When my sister and I were girls, on hot June days, our Mom would send us with a bowl of sugar to the backstep where her rhubarb patch was within arms' reach. Ruby stalk by ruby stalk, we'd wipe off the most evident dirt with our fingers, then dip -- and dip and dip -- the rhubarb into the bowl to sweeten each tart biteful. 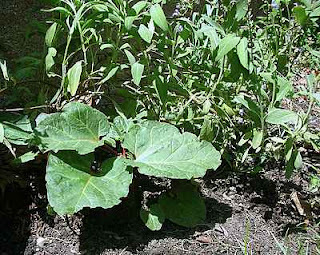 When I was home last summer, I rescued the last bits of my Mom's Round-up ravaged rhubarb from the back step and planted it in my own garden. Some years must pass before my rhubarb plants will qualify as a patch but someday I'll sugar my very own rhubarb. Rhubarb? It's almost as good, straight from the farmers market and this time of year, even, carefully picked over, the supermarket. 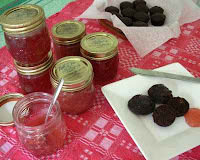 This week's Kitchen Parade column is a kitchen lesson in how to make rhubarb jelly and rhubarb jam. In an hour, you'll have six or seven pints of rhubarb confection. Where's that column? In Kitchen Parade, of course! Botanically, rhubarb is a vegetable. And since it suits my northern soul, rhubarb recipes show up often on both A Veggie Venture and in Kitchen Parade. How about a cinnamon-sweetened rhubarb pie? or an unusual but simple rhubarb sorbet? Or for true indulgence, consider a rhubarb cobbler or last year's favorite with my book club, a rhubarb bakewell tart.